The Centralasian republics of Turkmenistan, Kazakhstan, Uzbekistan, Kyrgyzstan, and Tajikistan became independent in 1991. The five states comprise 51 million people from a hundred different ethnic groups. GDP per capita is low in Kazakhstan, lower in Turkmenistan, and at poverty level in Tajikistan and Kyrgyzstan. China has invested heavily in Centralasia. Two pipelines now carry Kazkah oil and Turkmen natural gas to China. The gas pipeline will soon take gas from Uzbekistan, Kazakhstan, and eventually Afghanistan too. The Shanghai Cooperation Organization includes four Centralasian states (all but Turkmenistan), Russia, and China, and has been fighting terrorism, separatism, and extremism. The Centralasian states, apart from tiny Kyrgyzstan, remain dictatorships. Corruption and criminalization of politics are endemic, social services declining, and security forces weak. The presidents of Uzbekistan and Kazakhstan have each been in power for 23 years. The first president of Turkmenistan died in 2006. The ruling elite in Tajikistan is involved in the Afghan drug trade. Kyrgyzstan has an impoverished population of 5.5 million. Since 2001, US administrations have prioritized military cooperation with Centralasian states. The US Central Command has handed out money or favors to their leaders and their intelligence services. The main US and NATO interest has been to maintain bases in Uzbekistan, Kyrgyzstan, and Tajikistan. The Uighurs are an increasingly militant Muslim ethnic group in the eastern Centralasian states and western China. 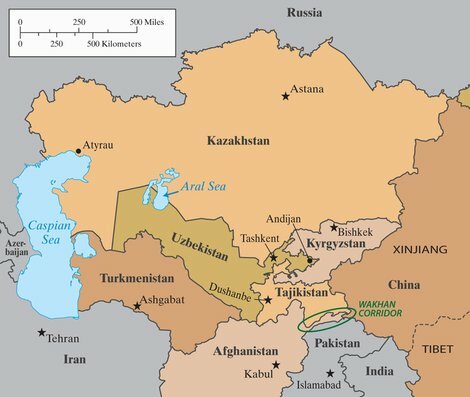 The Islamic Movement of Uzbekistan (IMU) is largely made up of Turkic groups ranging from Chechens, Turkmens, and Uighurs to ethnic Turks, and recruits include Tajiks, Pakistanis, and Kashmiris. So far in 2013, US and NATO special forces in Afghanistan have carried out twelve operations against IMU cells. AR The lands of Genghis Khan and Tamerlane could be the final fortress for the Islamists.